Most people love chocolate, as the huge selection of upscale and gourmet chocolate bars lining part of an aisle at any large grocery store will attest. But are any of these luxurious confections, with ingredients such as lavender, sea salt and even bacon, actually gluten-free? Keep in mind, though, that not all options from these manufacturers are safe for people who have celiac disease and non-celiac gluten sensitivity. Read on for which specific flavors you can choose when looking for a gourmet gluten-free chocolate bar. Yes, pure chocolate is gluten-free. 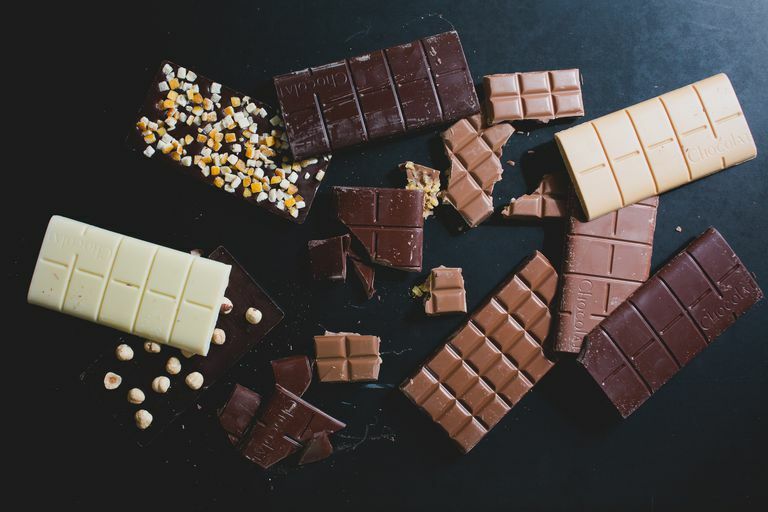 However, chocolate bars contain multiple ingredients, and their ultimate gluten-free status will depend on those ingredients, plus how the manufacturing process was handled. For example, some chocolate bars are gluten-free down to 20 parts per million or even less, while others have no gluten ingredients but might be processed on equipment that also processes foods that contain gluten. And of course, some chocolate bars will contain gluten ingredients themselves, such as cookies, crackers, or malted rice. To help you wade through the thicket of chocolate bar selections, here's a list of manufacturers and products with information on whether or not they're safe to consume on the gluten-free diet. I've grouped the manufacturers in two lists: the first list includes chocolate bar manufacturers with products that are considered gluten-free to at least 20 parts per million, while the second list includes manufacturers with "no gluten ingredients" chocolate bars that nonetheless have a risk of cross-contamination that the manufacturers say makes them unsafe. Alter Eco. Based in France, this fair trade company offers chocolates made by a Swiss chocolatier in varieties including Dark Salted Brown Butter, Dark Super Blackout, Dark Quinoa, and Dark Coconut Toffee. Almost all flavors are gluten-free (Alter Eco Dark Salt & Malt, which contains wheat flour and barley malt flour, is an exception), and many flavors also are certified gluten-free by the Gluten-Free Certification Organization (GFCO), which tests products to make sure they contain fewer than 10 parts per million of gluten. Check the label to make certain you're purchasing a gluten-free variety, as products and ingredients may change. Alter Eco also makes gluten-free truffles that echo the taste of the non-gluten-free Lindor Lindt truffles. Dove Chocolate. Dove Chocolate, a division of Mars Chocolate, makes all of its Dove chocolate bars and other products gluten-free to 20 parts per million. However, you always should check labels, the company says, since production timing might require the company to use an alternative processing facility that has a cross-contamination risk. Dove will disclose any potential gluten cross-contamination on its label. Endangered Species Chocolate. Endangered Species, which makes all-natural and organic chocolate bars with illustrations of endangered animal species on them, is certified gluten-free by the GFCO, meaning its products contain less than 10 parts per million of gluten. According to Endangered Species' allergen statement, "all of our products are produced on shared equipment that processes products containing milk, peanuts and other tree nuts" (but not gluten). You can choose from a variety of dark and milk chocolate flavors, including dark chocolate raspberry, dark chocolate with espresso, and milk chocolate with cherries. Enjoy Life chocolate bars. Enjoy Life—a well-known producer of allergen-free foods—makes three different chocolate bars: dark chocolate, rice milk (not regular milk, since it's allergen-free) and rice milk crunch. Enjoy Life products are made in a dedicated gluten-free facility and are free of dairy, tree nuts, peanuts, eggs, soy, fish, and shellfish in addition to wheat and gluten. Its products are certified by the GFCO, meaning they should contain less than 10 parts per million of gluten. Hershey's Chocolate. Hershey's makes many different chocolate bars, but only considers two of them to be gluten-free to 20 parts per million: its plain milk chocolate bar (only in the 1.55 oz. size) and its milk chocolate with almonds bar (only in the 1.45 oz. size) (some Hershey's Kisses are also considered gluten-free). All other Hershey's chocolate bars, including Hershey's premium Extra Dark chocolate bars (in all flavors), have a risk of gluten cross-contamination due to shared facilities or equipment, according to the company. Hershey's will include any gluten ingredients on the label (including wheat, barley, rye, oats or malt) so that it's easy to determine which specific products include those ingredients. Nestlé. Nestlé makes a variety of products it considers gluten-free (check out my overall gluten-free candy article for the list), but when it comes to chocolate bars, it only considers its Nestlé Milk Chocolate bar to be gluten-free. Nestlé will label any gluten ingredients and any risk of gluten cross-contamination. Scharffen Berger Chocolate. Scharffen Berger (which is owned by Hershey's) labels its chocolate bars gluten-free, meaning they contain less than 20 parts per million of gluten. The brand specializes in dark chocolate (some of which contains cacao nibs), but also offers milk chocolate bars. Vosges Haut Chocolate. Vosges, which makes some really interesting gourmet chocolate bars (try Dark Chocolate and Bacon, or maybe even a Red Fire Exotic bar with Mexican ancho and chipotle chilies, Ceylon cinnamon and dark chocolate), will label its products gluten-free if they're below 20 parts per million of gluten. You can search for gluten-free products specifically on the brand's website. Wild Ophelia. This brand is the "spirited younger sister" to Vosges Haut Chocolate and was created to encourage, educate and propel young female entrepreneurs. A portion of sales funds Wild Ophelia's grant program to support women entrepreneurs. All the brand's products, which include five chocolate bars with interesting flavors such as Barbecue Potato Chip and Beef Jerky, are gluten-free. Wild Ophelia also makes Cold Brew chocolate coffee bites and four different varieties of peanut butter cups. These brands include chocolate products that aren't considered safe on the gluten-free diet, either because the candies contain gluten ingredients or because they're at risk for gluten cross-contamination in the manufacturing process. Dagoba Chocolate. This brand is a division of Hershey's, which has a policy of labeling any ingredients containing wheat, barley, rye, oats or malt. However, even if a Dagoba chocolate bar appears to be gluten-free by ingredients, the company says it still may contain traces of gluten from shared equipment, and so cannot be considered gluten-free. Ghirardelli Chocolate. According to the company, Ghirardelli only produces one product that contains gluten (its Luxe Milk Crisp singles and bars, which contain barley malt). However, all its other chocolate bar products, including the Intense Dark, Luxe Milk, and Squares chocolates (the ones filled with flavors like caramel and raspberry) are made on the same lines. The company does clean the lines between products, but doesn't call its non-gluten-containing products "gluten-free." Godiva Chocolates. According to the company: "ALL of our products including solid chocolate pieces may contain gluten. Any person with a gluten allergy should NOT consume ANY of our products." Green & Black's Organic Chocolate. Green & Blacks produces one gluten-containing chocolate bar—its Toffee bar, which contains wheat-based glucose. The company does not label any products as gluten-free, and has this statement on shared facilities: "We take into account scheduling of products and we clean the lines by flushing chocolate through until there is no notable trace of the previous lines’ chocolate in the new batch. We are confident that the cleaning procedures are robust and eliminate traces of nut, cereal or dairy ingredients, but the only certain guarantee of absence is by manufacturing in a nut, cereal and dairy free site." Lake Champlain Chocolates. Although Lake Champlain Chocolates has chocolate bars without gluten ingredients, it also manufactures gluten-containing products on the same equipment. "We cannot guarantee that any of our products are entirely free of trace amounts" of gluten and other allergens, according to Lake Champlain. Lindt Chocolate. Although Lindt Excellence premium chocolate bars contain no gluten ingredients, "trace amounts of these gluten ingredients and components may have the opportunity to come in contact with non-gluten products," the company says. They are manufactured on the same lines as products that include barley malt (Lindt's popular Lindor truffles all contain barley malt). Newman's Own Organics. Newman's Own makes six different premium chocolate bars. All may be produced on equipment that also processes wheat, according to the company. NewTree Chocolates. According to the company, "NewTree Dark Cocoa, Blackcurrant, Lavender, Ginger, Apricot, Cherry, Cinnamon and Pink Peppercorn are not made with gluten ingredients, [but] they are manufactured with machines that may contain traces of gluten." Theo Chocolate. Theo Chocolate makes plain chocolate bars plus really interesting flavors such as Coconut Curry and Fig, Fennel and Almond. However, the company also makes gluten-containing flavors such as Bread and Chocolate on the same equipment. Toblerone Chocolates. Toblerone doesn't manufacture any products that contain gluten. However, the company does not label its chocolate bar products "gluten-free," so you should use caution in eating any of its products. All Toblerone flavors contain milk. Vivani Premium Organic Chocolate. Vivani maintains a list of chocolates on its website that it claims are "gluten-free," including lots of dark and milk chocolate bar products. However, the company notes that "possible traces due to production processes cannot be ruled out," so you'll need to use your own best judgment. While you might be disappointed to miss out on some premium chocolates like Lindt and Godiva, you still have plenty of selections that are safe for people with celiac disease and non-celiac gluten sensitivity. Options range from the readily-available Hershey's Milk Chocolate Bar and Dove Chocolate to the more exotic flavors available from Endangered Species Chocolate and Vosges Haut Chocolate. And if you want candy that's not a gourmet chocolate bar, there's plenty of gluten-free candy and even some gluten-free candy gift boxes you can choose.